Follow the links here and here to hear Ramesar’s versions of Lalbihari Sharma’s songs. Amar Ramesar has also put the Guyanese poet Martin Carver’s poem “This is a Dark Time My Love” to music and translates part of the poem into Hindi here. Rajiv Mohabir: You have a very interesting fusion sound that shows evidence of studying both Western and Hindustani classical music. How were you trained as a musician? Who are your greatest musical influences? Amar Ramessar: My training as a musician started during my early childhood days in a rural village, called Enmore, located on the East Coast of Demerara. This village is the womb of many outstanding East Indian musicians and pandits. Because I grew up in a very orthodox Hindu home, where my late father once lead the village in Ramayan chanting and Hindi classes coupled with other teachers from the village who taught music at the mandir once a week, he ensured that I was part and parcel of everything, so that I could learn. My late grandfather and father were excellent dholak players. My dad was also an excellent singer, but he only sang when he lead the mandir devotees once a week in Ramayan satsang and chanting slokas from the Bhagwat Gita. Other than that he never sang. He never had formal training in music. The first musical instrument I was predisposed to was the dholak. The instrument was always at my home, and so, I would always be experimenting with it, with my dad teaching me the basics. He also taught me Hindi. This type of learning is regarded as Guru-Shishya Parampara, where the knowledge is passed down from teacher to student in an informal manner. I still remember to this day when he taught our youth group at the mandir to sing chowtaal, a genre of Bhojpuri songs that are usually sung in loud voices, and whenever our group sang, there was always one common observation from people in the community and outside of the community — that we were always melodious and appealing, which were two things my dad always stressed about. Growing up I enjoyed playing dholak. In rural villages in Guyana, there are three types of instruments that can be readily seen. The dholak, dhantaal, and the harmonium. While the tabla is present, it can only be found in the city, among the middle and upper classes. My vocal training started at the mandir also. There I learnt to sing bhajans. It was through my singing that I learnt to play the harmonium, purely self taught. Whenever I sang, my dad would play the dholak for me. He was very serious when it came to music. He always insisted that whenever I sang, melody and “timing” should be intact. However, when I finished high school, I developed a great passion for learning the tabla and Indian classical music proper, and the only place I could have done so was at the Indian Cultural Centre in Georgetown. In 1989, I registered for tabla classes under Guruji Mandal from India. That was when my formal music training started in Hindustani classical music. I spent one year in the tabla class, doing vocal as well. I took a break because of work and other circumstances and reregistered once again for tabla and vocal classes with reknowned tabla player from the Bhatkande Music University, India, Guruji Arun Bhatt in 2005–2007. It was during these years that I was exposed to the world of Indian classical music. These were the years that molded me as a musician. We did many performances together around the country at various events, even performing live for kathak recitals. I studied under a few more teachers during the years 2008–2009, such as Vibash Sengupta and Bhagwan Shukla. My greatest influence would certainly be my father, the late Deodat Ramessar, who created the foundation for me, the many elders in the village, who always encouraged me to work hard and always stay focused, in addition to all my Gurus at this Indian Cultural Centre. There are many international artists as well that influence me through their work. Artists such as Grammy-winner AR Rahman, Yanni, Nitin Sawhney, the whole gamut of Indian classical musicians, Bob Marley, and many others. Rajiv Mohabir: What are your favorite instruments to play and to listen to? Amar Ramessar: It is difficult to say my favourite instruments to play and listen to. I love percussion instruments on the whole. I love to play the dholak, the tabla, the Djembe (an African drum), and the Tanggu drum (a Chinese drum). As a matter of fact, in my room, there are always the Harmonium, the Djembe, and the Cajon (a Spanish percussion drum). I have a piano in my home as well, and when I have a hard and stressful day, I head straight to it and play and sing some of my favourite Lata Mangeshkar and Mohammed Rafi songs, in addition to others. I love to listen to these different instruments when played together. They create so much magic. It breaks all human barriers and the world becomes one common place. Not to mention the vibrations of unity, peace, and love that are always evoked. I love world music, it opens my horizon as a musician. My collection of instruments tells this story of my embrace of world music and world cultures. Rajiv Mohabir: Recently you have taken Lalbihari Sharma’s chautaal lyrics and put some of them to music. What’s remarkable about this is that his songs come to us from 1916, written in Demerara. Can you talk about the decisions that you had to make when you put Lalbihari Sharma’s songs “Baaji Ghanti” and “Sakhi Uti Kar” to music after they were written a century ago? Amar Ramessar: “Sakhi Uthi Kar” and “Baaji Ganti” are two historical pieces of writings by an Indian immigrant, Lal Bihari Sharma, that were referenced in Gaiutra Bahadur’s book, “Coolie Woman — the Odyssey of Adventure.” The poems reflected pure and honest thoughts as well as vivid observations of the happenings on the plantations. My intentions were to take those two pieces of writing that were penned in a colonial period into a modern era without any form of adulteration. Chowtaals are normally sung in loud chorus by two groups of men on opposite sides using the dholak and jhaals. What I did with these two traditional chowtaals was I “reconstructed” them into a more contemporary musical arrangement, with a brilliant blend of electronic instrumentation, coupled with the traditional tabla and guitars to produce a rich blend of pleasing sounds, tilting more to the ghazal and traditional Indian folk music styles. The first chowtaal recorded was “Sakhi Uthi Kar” in 2014, and it was dedicated to the 176th anniversary of Indian arrival to Guyana. I am very proud of this piece of work, not only because it was my first attempt to compose, but the work has inspired a lot of people in the literary world. I got great feedback from it as well. One of the most important things that I am really proud about in this piece of work is that the song is currently a feature on the prestigious online literary journal, Asymptote, as part of some work done by award-winning writer, Dr. Rajiv Mohabir. “Baaji Ganti” was the second piece to be recorded and had a more traditional Bhojpuri touch to it, with elements of a rhythm pattern that are very similar to the Ghoomar folk style — traditional Rajasthani folk music. This recording was a dedication to the 178th arrival of East Indian arrival to Guyana. The songs were recorded right in Guyana by the Shakti Strings studio. Rajiv Mohabir: How do you think that your history of Indian indenture has influenced your creative work as an artist? Is it something that you think about when you are writing or does it surface subconsciously like something that haunts you? Amar Ramessar: The history of Indian Indenture definitely has some influence on my work and, yes, sometimes surfaces subconsciously. Being a by-product of “bonded coolies” and unpleasant indentureship, as a musician, can shape your creative perspectives. As such, I have to be careful that my music does not come across as “sad, painful, and dreary,” but rather one that tells a story of resilience. As a musician, my open-mindedness to all genres of music and cultures hinges on how my ancestors were able to break the human, social, and religious barriers on the voyages as well as on the plantations and how they were able to maintain the spirit of Jahajism. More importantly, how they were able to overcome their challenges and create newer and better experiences. My appetite for cross-cultural musical collaborations and creating newer musical experiences are what drives me and my music. Rajiv Mohabir: You make stylistic choices based on what I can see is your Indian identity playing into your sense of Guyanese nationality. Can you talk a little bit about your intention behind translating Martin Carter’s poem “This is a Dark Time My Love” into Hindi? What inspired you to do this? What was the effect you were hoping for? Amar Ramessar: My two recordings of Lal Bihari Sharma’s chowtaals were well received among Guyanese at home and in the diaspora, in addition to those in academia as well as literary activists who work to promote Guyanese poetry. It evoked a new craving for this kind of work. It was Isabelle Decaires, daughter of the late Guyanese entrepreneur and owner of the Stabroek News, David Decaires, who asked me during a meeting in the year 2015 at the Moray House in Guyana if I would be interested in composing in one of Martin Carter’s poems in both Hindi and English. I was thrilled to be offered this fantastic opportunity, among the many musicians in Guyana and in the diaspora to compose one of the most brilliant Guyanese and Caribbean literary giant’s work. Isabelle gave me a copy of “Poems Of Resistance,” written by Martin Carter, and told me to peruse it and select one of my choice. I read all the poems in the book, but the one that resonated deep within me was “This is a Dark Time my Love.” Every word of the poem was immensely relevant to all that was happening in Guyana at the time of reading it. While the poem was written as a form of protest to the British occupation of Guyana after its independence, it seemed to me that it was written for this current period we are living in. The words were very prophetic, because everyday in the newspapers, there were reports of crime and scandals and political disingenuity. There were lots of discomforts among the populace. I wanted to put to music those profound thoughts of Martin Carter. Guyana is a heterogeneous nation, so I wanted the music to relate to all Guyanese, hence the translation in Hindi. Translation of the poem to Hindi was not done by me, but by a good friend of mine, Sagar Patil, who is from India but studying Medicine in Guyana at the Greenheart Medical University. The English parts of the song were rendered by two students of the National Music school, Alana Warde and Joyce Bamfield, whom I met while conducting a special six-month course on the Harmonium at the Music School. - To instigate the need for more cross-cultural collaborations in Guyana. - To build on the movement of social cohesion. Many musicians in Guyana sadly operate in a vacuum, only working in their own comfort zone and genre of music. Music is a powerful vehicle for positive change. - To have a greater appreciation for poetry in a more innovative, exciting, and appealing manner. - To have such compositions be part of the collection of our national songs. - To have such presentation of poetry as part of our national school curriculum and instigate newer national poetry recitals and contests. - To instill in Guyanese a sense of national pride in our cultural and musical diversity. Rajiv Mohabir: Chutney music is a type of music that is often relished for its evolution from traditional Bhojpuri folk musics. 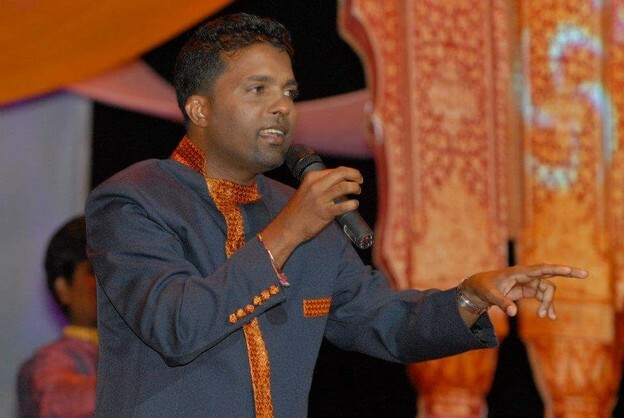 What is your relationship to chutney music as both an artist and a DJ for Guyana Radio? As an artist, my present relationship with Chutney music is a contentious one, because much of the work produced for consumption is a prostitution of the richness of Bhojpuri folk music. While traditional Bhojpuri music revolves around themes such as mythical Hindu relics, festivals, and strong social messages, the chutney music produced today is a glorification of elements that are largely responsible for the degradation of the moral and social fabric of our society. With the fusion of soca and chutney, the issues get further compounded. As an announcer/DJ, there is a continuous personal battle I am confronted with every time I have to play chutney or any other genre of music on the radio. I have to ensure that the lyrics are clean and the message is good enough for children listening. Artists such as Kanchan and Babla, the late Anand Yankarran of Trinidad and Tobago, as well as Kris Ramkellawan and Ramdeo Chaitoo of Suriname have done well in preserving these tenets of this rich genre of music. As such, it is incumbent that this current crop of musicians learn the Hindi language and build on the great legacy left by these great artistes.